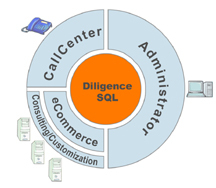 Diligence Software Suite is your platform to data-driven success: complete, secure, interconnected, and focused. Diligence Portals empower your segmented users: provide information THEY want to see, let your users determine THEIR level of participation. Engage your constituents in meaningful and effective ways! Every organization is unique and we understand that. Use technology-driven approaches that fit YOUR organization’s needs and make success much more likely. The Internet of Things is accelerating. Where does your organization stand in this interconnected world? Rubber meets the road when a transaction occurs. How smooth is your road? Help your customers by making the transaction easy and fast. Help your organization by getting access to the funds sooner. The Ambitios Diligence Software Suite helps you process and manage your contribution information efficiently. Instead of spending valuable volunteer/employee resources on tedious data gathering, data cleansing, and information organizing have them do what they do best: raise funds and enhance relationships with your constituency. Studies show a direct correlation between customer retention rates and profitability. A separate study shows that non-profits have higher renewal rates when contributors receive immediate thank-you acknowledgement and appreciation.